Me. Right, the year 2006. Left, early 2000s. Body fat: eternal? My abdomen has been large for most of my adult life. 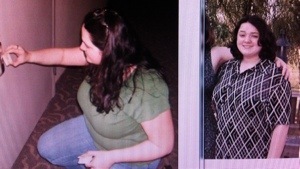 I am having technical difficulties today, so you get to see onscreen images captured with my phone of what my body looked like 10 years ago, and again 6 years ago. Even after I’d started the cycle of working out and trying to constraint caloric intake, I still had an abdomen of which I was ashamed. And since these were photos I kept, just imagine the unflattering photos I deleted instead of saving forever on my hard drive. 40 pounds down from my weight of around 203 in March 2011, I still have a protruding abdomen, but it looks better, and I am a lot healthier in every way because of my fat loss. My clothing size has changed, which I’ve mentioned often in this blog. I have yet to replace everything that I’ve become too small to wear – including dresses. Take into consideration that most of my dress collection that I still have was bought to keep me comfortable after gallbladder surgery during the Texas summer, and pretend to feel bad for me when I complain that I have nothing to wear to a holiday party tonight. 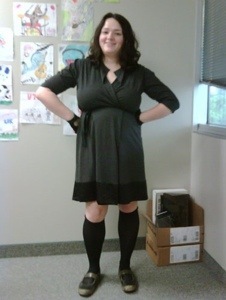 I tried on this charcoal gray wrap dress that is slightly warmer than my sundresses and sleeveless party attire. My boyfriend and I agreed that even though I looked better in it now, it still skewed very “maternity” because of the ability of the Empire waist to enhance the stomach. Photo below is from 2010 or 2011. Empire waist, you are so maternity on this tummy. Ugh, fine. What do I do? Go buy a new dress, right? What an awful problem to have, I know. I’m just glad that I have disposable income again that I can spend on clothes. Extreme budget clothes-buying is entirely doable, but it mostly puts you in single-color tees from big box retailers. That’s how I spent my summer, anyway. 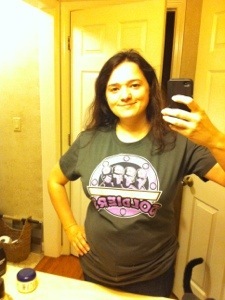 Recent photo, modeling a t-shirt sent to me by a friend. Everyone should have such terrible problems. Clothes shopping is still kind of lame, especially as a woman with a large abdomen, but I can take heart that Empire waists are less in fashion, my continued fat loss will lead to more clothing choices (sometimes you buy the dress that’s there instead of the dress you want, especially at plus sizes), and I can afford to put money into the economy on an item I don’t truly need. This entry was posted in clothing, weight loss and tagged body image, clothing, friday fatloss fashion, Photos, results, weight. Bookmark the permalink.